is the ultimate expression of elegance, aesthetics, innovation and design, combining technology and elaborate details. Modernity and tradition mixed with elegance and simplicity, truly Designed to Envy. 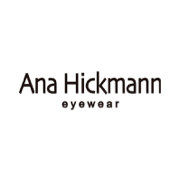 With the aim of transmitting an image of sophistication, Ana Hickmann Eyewear expresses womanliness and true timeless elegance. It is characterised by high quality materials, modern design and style. System developed specifically in the frame temple that allows a rotational movement, revealing colors and surprising combinations of materials and allowing two looks in one single frame or sunglass.